From the 1st of April Sligo County Library will no longer be sending the second manual text message informing Patrons/Members of requested items available for pick up in Sligo County Libraries. 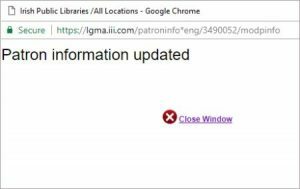 As a result, Patrons/Members of Sligo County Libraries who have not “opted in” their mobile phone numbers on Sierra, the Library Management System will not be informed that an item they requested is available for them to pick up. This change will only affect Patrons who have not opted in their mobile phone number. Patrons who receive messages by email are unaffected by this change. If you are concerned that your mobile phone number may not have been opted in (an indication would be that you have only ever received one text message telling you that an item was available for pick up) please ask a member of staff to show you how to opt in your mobile phone on your next visit. 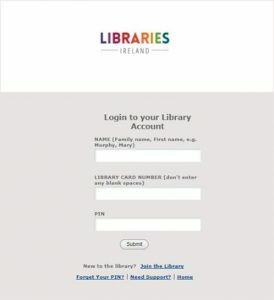 Alternatively, you can select Review My Account and you will be brought to the Libraries Ireland website. Fill in your Surname, Library Card Number (the number on the back of your membership card underneath the barcode) and Pin Number. (If you do not have your Pin Number, please ask a member of staff on your next visit for it). You will now be brought to your account.